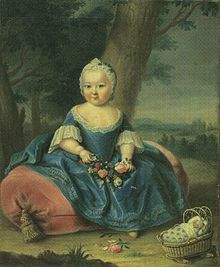 Maria Christina was born on Maria Theresa’s 25th birthday, on May 13, 1742, and was her fifth child. 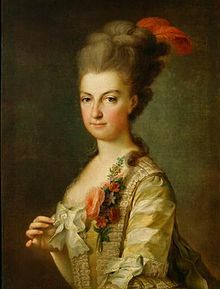 Maria Theresa called her Mimi, and it was said that she was her favourite child. Certainly, her tutors felt she was the brightest of the Hapsburg children. She was also pretty and an accomplished painter and her portrait of the royal family on St. Nicholas’ Day still hangs at Schönbrunn Palace. Maria Christina was not popular among her siblings. She was considered a “tattle-tale” and her mother’s obvious preference for her sparked jealousy among the others. She did form a close attachment with her melancholic sister-in-law, Isabella of Parma. 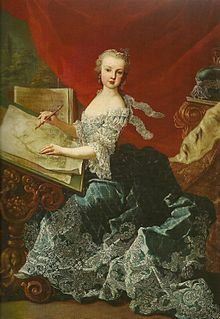 Isabella died in 1763. Years later Isabella’s letters to her were revealed in which Isabella pledged her undying love to Maria Christina. In 1766, Mimi was allowed to marry for love, something that was not allowed to the other children. 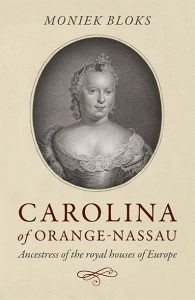 Her choice was her second cousin Albert of Saxony, the son of Maria Theresa’s cousin Maria Josepha and the King of Poland. Albert was given the title Duke of Teschen. 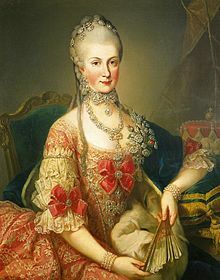 Maria Theresa also gave them other gifts and property, in order she said, to equalise them since Albert was not wealthy. Albert was given a position as Field Marshall of Hungary, and the couple lived in Bratislava and visited Maria-Theresa in Vienna frequently. In 1767, Maria Christina gave birth to a daughter who died the next day. Maria Christina herself almost died, and the couple had no further children. They focused on creating a lively cultural court, and it was here that they began collecting art, a shared interest. They had long been promised the role of Governor of the Austrian Netherlands. However, they had to wait until the current holder of that title, Maria Theresa’s brother-in-law, gave it up. This he did by dying in 1780. Maria Theresa herself died that year and her successor, her eldest son Joseph, made them mere figureheads, appointing a minister to actually implement his policies. In Brussels Maria Christina and Albert initially focused on entertainment and culture. They built the Palace of Laeken which is still used today as the home of the Belgian Monarchs. It would have been better if my sister had never married. Joseph’s policies in the Austrian Netherlands were extremely unpopular. Maria Christine and Albert’s protests to Joseph were ignored as the situation grew tense. At one point a mob broke into their residence and forced them to retract an imperial decree. The Brabant Revolution, inspired by the French revolution, led to their expulsion. 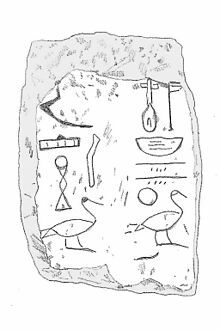 When Joseph died, his successor was able to regain control, and they returned in 1791. The events of the French revolution soon overtook them once again. As French revolutionary troops entered the Austrian Netherlands in 1792, Albert and Maria Christina were forced to flee a second time. They sent their art collection ahead of them by sea, and one of the ships was lost. The collection eventually formed the basis of Vienna’s Albertina Museum.